I really got carried away seeing all the pumpkin delights all over the internet, blogosphere, pinterest i.e. almost everywhere you look around on the netsphere at this time of the year. I have never made or eaten anything which has pumpkin in it. But looking at these pumpkin creations I got myself buying my first pumpkin ever and waiting to make something delightful out of that. For this reason, I love the fact that I have a blog which gives me such adventures and I often find myself in unfamiliar territory experimenting with some never tried ingredients, experimenting some never tried tastes and also knowing different cultures, cuisines. This is all so incredible. Here in India, we don't get canned pumpkin puree. But that did not lower my spirits in any manner whatsoever. Hence, this is gonna be another DIY project from scratch and I am excited! 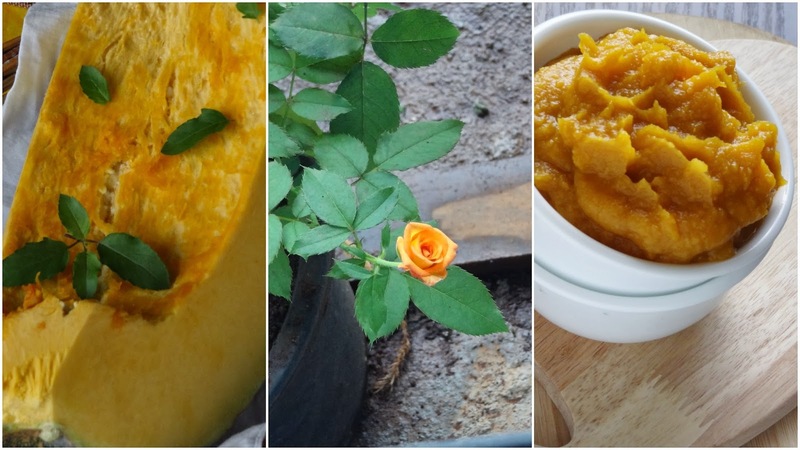 There are different ways to prepare pumpkin puree at home. For my first, I prepared the pumpkin puree by roasting the pumpkin. It's great to make this pumpkin puree recipe ahead and freeze so that you’ll have plenty on hand to use in any pumpkin delight you would like to make. 8. Puree the pumpkin in a food processor or with a hand held blender. Once the puree has cooled entirely, place in freezer containers or ice cube trays. Leave some room at the top (headspace) of the containers or individual ice cube compartments. Label, date and freeze the puree for future use.